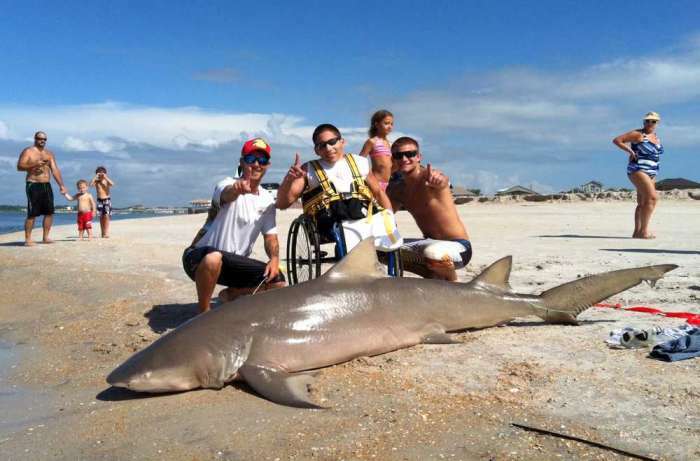 A young wheelchair-bound man in a manual wheelchair recently made news for his amazing catch of a 250 pound lemon shark. Matt Sechrist, a 19 year old teenager from Florida, attempted and succeeded in baiting and catching a giant lemon shark, which was still alive when it was caught. The man was assisted by his father and friends, but did something on his own that is very courageous and also very exciting. While he was seated on his wheelchair off the coast of Vilano Beach in Clay County, Florida, Sechrist locked his brakes and harness in place, and started a fight with a mammoth that lasted over an hour. The 8 foot, 250 pound shark usually grows anywhere from 7 to 10 feet in length and is known to be hard to detect underwater, their yellow-brown skin allows them to camouflage underwater, and is known to be a dangerous predator. This feat is only topped by the fact that the Sechrist family released the shark into the ocean after taking a photo of the catch, which is almost never documented after a story of this sort.